Clogging is related to tap dancing, but has a different style. Cloggers have a distinctive up and down body motion and emphasize the downbeat of the music. There is also a distinctive “chicka-boom” sound that cloggers make. Tap dancers tend to be lighter and tap out the melody, rather than the beat. Most cloggers today do wear taps, usually the 2-piece kind, to emphasize the sounds of the feet. 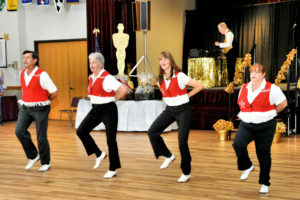 Modern cloggers often do precision clogging, which means that all the dancers are doing the same steps at the same time. This can be in choreographed routines (often written to perform in front of an audience), or in recreational style line dances. Clogging line dances have become the most popular form of clogging these days. Workshops and convention often include teachers introducing new line dances and a floor can have 100 or more dancers all doing the same steps. It’s something to watch! Today cloggers dance to many styles of music, but always music with a lively beat. Bluegrass music is the traditional music, but you’ll find country, pop, and hip hop used just as often. Line dances are the most popular style in many areas, but clogging can be done solo, in couples, small groups, or large groups. Freestyling, or hoedowning, is where each dancer is doing his or her own thing, executing steps as they come to mind. Precision clogging refers to two or more dancers executing the same steps at the same time. Cued dances are a popular form of recreational clogging where the sequence is cued to the dancers. The dancers are familiar with the steps, but they don’t have to memorize the entire dance sequence. This way dancers can enjoy many more dances than if each one were memorized. Many groups also spend additional time to learn precision clogging routines to perform. These may include fancy step sequences as well as the dancers going through figures and different patterns with each other. Usually the dancers will all wear the same costume. What Kind of Music do Cloggers Dance to? One of the best things about today’s clogging is that you can do it to so many different kinds of music: hillbilly, Cajun, Irish, boogie woogie, rhythm & blues, rock, pop. The huge success of country music has made it easy for “clogeographers” to create dances to the biggest top 40 hits. In the clogging world, new dances are being created and introduced all the time. A few of the hottest clog routines created in recent years have been Down at the Twist and Shout, Bad, Ghostbusters, and That’s What I Like About You, plus hits of recent decades: Oklahoma Swing, Cajun Moon, and Wake Up Little Susie. Not surprisingly, there are traditional clog dance routines for traditional old American folk tunes, such as Turkey in the Straw. Standards of a slightly newer vintage include Hambone, Jambalaya and Cripple Creek.